Apple has updated its iLife ’11 apps today. The updated apps are iPhoto (image manager), iMovie (video editor) and GarageBand (audio editor). These apps are available with new Macs as part of iLife ’11, they are also available in the Mac App Store for $14.99 each: iPhoto, iMovie and GarageBand. Update: Apple has also updated iDVD and iWeb. â€¢ Support for opening projects imported from iMovie for iOS. â€¢ Fixes an issue where some audio adjustments were not preserved. â€¢ Addresses a performance issue when using large quantities of video clips with keywords. â€¢ Resolves issue with slow application launch when working with large iPhoto libraries. â€¢ Fixes an issue with the GarageBand Lesson Store not completing single or multiple lesson downloads. â€¢ Corrects issues with some tempo-based effects falling out of sync with main song tempo. â€¢ Resolves problems with Magic GarageBand project files not opening up correctly in the GarageBand tracks view. iWeb 3.0.4 improves overall stability and addresses a number of minor issues. 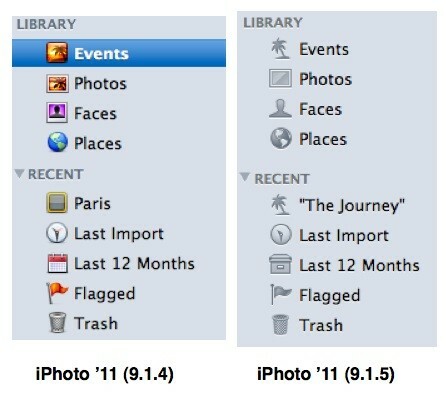 â€¢ Improves reliability of imported iPhoto ’11 slideshows. â€¢ Fixes a problem that could prevent files from re-linking. â€¢ Addresses an issue that could cause iDVD to use all available CPU capacity when searching for missing files. If you bought the app from the Mac App Store then the update is available in the Updates tab. If you own an retail version of this app then to install the update click the Apple logo then choose Software Update. The update is currently only available for the Mac App Store version of these apps. We expect that Apple will release the regular update soon.